Not only does this glow-in-the-dark powder inlay add color and contrast to your projects, it glows in the dark up to 10 hours! 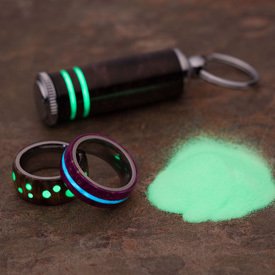 This photoluminescent phosphor powder is perfect for projects like rings, light pulls, pens and more. It can be bonded into a turned recess using thin cyanoacrylate adhesive with activator, then turned to shape using carbide tipped tools. Because it’s a very hard stone compound, it’s abrasive on tools and cutters and requires carbide tools for turning. traditional high speed steel tools are too soft. However, with a bit of patience, the results are well worth the effort! Comments On Dec 13, 2018:Pretty easy to use. Added some nice features to some of my bottle opener handles. Comments On Aug 10, 2018:This is a great addition to my wood ring choices. I recently started adding a crushed stone inlay on my rings which went over real well but when I added the glow powder to my rings I received awesome feedback from others. This glow powder is easy to work with and I still get a great finish. It really compliments the rings even in the light. Most people don't even realize that the ring glows until the lights go down. I am not sure exactly how long the glow last but I am sold. I would prefer to be able to purchase in larger quantities but I can live with the 1/2 oz packs for now. Comments On Aug 23, 2018:Great way to fill holes and be able to use an blank. Adds character as well.